After 36 years as Fourth Horn in the BBC Symphony Orchestra, Chris Larkin is returning to the freelance career that he quit in 1979. Chris’s first professional concert was with the R. P. O. under Sir Adrian Boult in 1968. Since then he has worked with many of the World’s most eminent maestri – figures such as Bernstein, Boulez, Dorati, Giulini, Haitink, Kempe, Mehta, Solti, Svetlanov, Rattle, Rozhdestvensky and Wand, and worked for every orchestra in the British Isles save about four. In chamber music he has been Director of the London Gabrieli Brass Ensemble [www.lgbe.co.uk] since 1973, appearing with them all over the World. With the LGBE he has directed four highly acclaimed CDs of brass music for the Hyperion label [www.hyperion-records.co.uk] and was privileged to conduct the ensemble in the first half of Tennstedt’s 1991 BBC Prom. He has also conducted the BBC SO on three occasions. As a soloist he has played the 4th horn parts in both Schumann’s Konzertstück (1995 Prom) and Mark-Anthony Turnage’s Four-Horned Fandango (U.K. & S. America Tour plus Chandos CD). 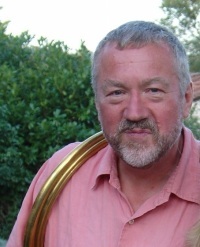 In 2014 Chris received the International Horn Society’s prestigious Punto Award in recognition of his lifetime’s research – all now ploughed into his talk Larkin – Around the Horn [www.chrislarkin.org.uk]. He is currently Chairman of the British Horn Society. In the film studios he recorded the music of legends such as Hank Mancini, Jerry Goldsmith, Michael Kamen and Marvin Hamlisch. With a passionate interest in the horn’s history he also plays period horns with such orchestras as O.R.R., O.A.E., A.A.M., and others in Europe. He plays Wagner Tuba (Ring cycles: Colin Davis mid-70s: Bernard Haitink mid-90s), natural cowhorn (Britten Spring Symphony) and Eb tenor horn (althorn).